An easy-to-grow annual flower, cleome or spider flower (Cleome hassleriana) is a prized addition to a garden because of the terminal flower clusters that are any shade of pink to rosy magenta or white. These four-petaled flowers with long spider leg-like stamens are fragrant. The erect plant grows about 4 to 5 feet tall and is lined with compound green leaves, each with three to seven lobes. After bees or butterflies pollinate the blossoms, seeds form and scatter to the ground and quickly sprout. Spider flower is native to south-central South America. If cleome is growing in a crumbly, fertile soil with good drainage and growing in abundant sunlight, insect pests are not typically a problem. When the plant is stressed from wet soil, too little sunlight or other conditions that don't promote good health, insect pests tend to explode into larger numbers. Or, if other garden plants (flowers or vegetables) are infested with certain insects, they may also attack spider flowers. According to the American Horticultural Society's "A-Z Encyclopedia of Garden Plants," spider flowers can be prone to damage from caterpillars, aphids, spider mites and whiteflies. The University of Florida adds that any array of stem-boring insects can cause trouble, too. Harlequin bug, a species of stink bug, can pierce its mouth into spider flower leafs and stems, eventually killing a plant if the damage is prolonged and the spider flower weakened, according to the Missouri Botanical Garden and U.S. National Arboretum. Signs and symptoms of insect pests on spider flower varies. Aphids are most common on new growth when plants are not receiving ample sunlight. Spider mites occur when conditions are dry and there is little wind; they create web netting on leaf undersides. Caterpillars feed on plant leaves, so look for holes or large chewed out portions of spider flower leaves. The harlequin bug has piercing mouth parts, so initial damage is seen as a tiny white scar on the leaf, according to the Missouri Botanical Garden. It leads to brown and distorted leaf shapes, and eventually plant wilting. 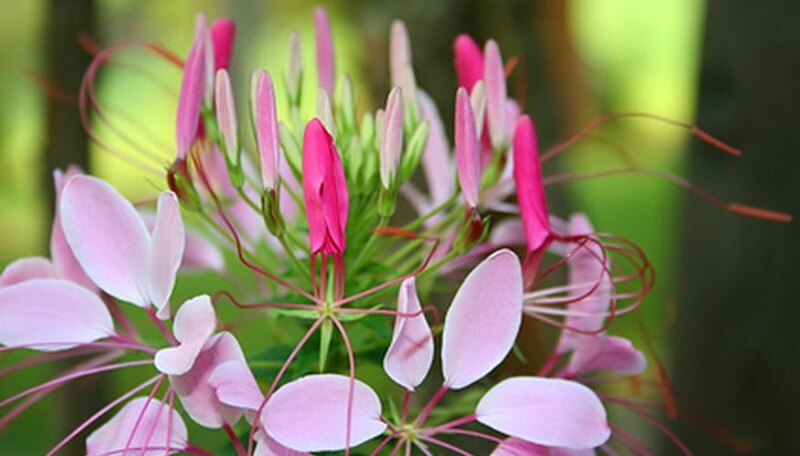 Growing healthy cleome flowers with proper watering, sunlight levels and well-draining soil often is enough to deter any major problems with insects. Nonetheless, bugs can appear. The U.S. National Arboretum suggests not being overly eager to spray chemicals as they will kill beneficial insects that naturally eat the bad bugs in the garden. You can hand-pick adult insect pests or knock them off the plant with a spray of water from a garden hose. Mild sprays of horticultural oil or insecticidal soap can be sprayed on infested spider flowers, too. Keep in mind that harlequin bugs are attracted to any plant that is a member of the cabbage family. Therefore, be wary of them if you have cabbage, broccoli, cauliflower or mustards growing in relative proximity to spider flowers in your landscape. Luckily, cleomes are fast growing and you also have the option to pull up unattractive or infested plants in the flower garden and sow more seeds. Or, if young seedlings are already sprouting under flowering plants, they can be monitored and allowed to grow to replace those that have been pulled. The U.S. National Arboretum mentions that unless the spider flowers are being physically distorted with ugly leaves or stunted growth, they don't need chemical treatment. Changing cultural practices or removing nearby plants that harbor the pests that find their way to the spider flowers are other ways to diminish problems.